Nothing in the House: PIE. A Hand Drawn Almanac: We Made A Book! PIE. A Hand Drawn Almanac: We Made A Book! Well. Ahem. Hello! I've alluded to this announcement on the ol' Facebook, but it's finally time to tell you. And what I want to tell you-- and it's something I'm very VERY excited about--is that illustrator Elizabeth Graeber and I are releasing a pie book!!! PIE. 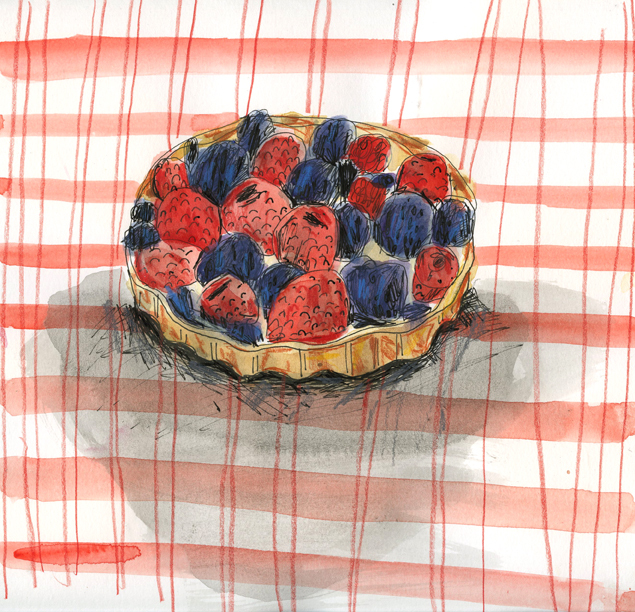 A Hand Drawn Almanac is a full color, fully-illustrated, 40-page collection of Nothing-in-the-House recipes and stories for a year's worth of pie making inspiration! It's been a lot of fun working with Elizabeth, whose work I've admired in An Illustrated Guide To Cocktails, the Panda Head Blog, and hanging on the walls and decorating the chalkboard at the new DC diner, The Coup. I think her illustrations are a good compliment to my style of writing and baking. They have such a whimsical, handmade element, are fun--not stuffy, and tell a story. We hope that this is just the start of our collaborations, so look out for more projects in the future...illustrated pie tool wall paper? Printed tea towels? We'll keep ya posted. For now though, the book! For more information you can check out this page on my site, or on Elizabeth's site here. PIE. A Hand Drawn Almanac is currently available at a special pre-order rate of $13! All pre-orders will ship out in early December, or you can elect to pick it up at our release party (details below). Pre-ordered books come specially packaged in a pastry bag and baker's twine. After December 5th, they will be available for $14 online and at various DC shops. You can place all pre-orders and orders right here! And for those of you in DC, come help us celebrate! We'll be having the PIE. A Hand Drawn Almanac Release Party on Wednesday, December 5th from 5:30-8:30pm at Ginger Root. Come pick-up a copy of the book, enjoy a slice of pie, and celebrate with us. More details to come, but you can get all the up-to-date info here. Thanks so much for checking it out, and as always, thanks for reading!